There are several different lighting fixtures found in our collections. Some are elegant, others plain, and others still are whimsical. We have a lot of electric lights and oil lamps from days of yore. All are useful and necessary. If the lights are on, we’re home and up doing something. It is not unusual to pass by our homes in the middle of the night and see the lights on-I suffer from insomnia and can’t stand to just lay in bed doing nothing, so I get up and do something before, hopefully, going back to sleep. 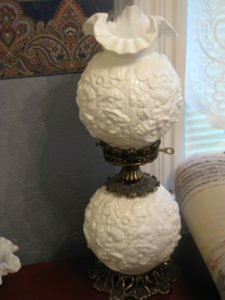 One of my most beloved lamps is my Fenton Art Glass Poppy lamp in milk white. I had admired the piece for several years at Julie’s Hallmark when it was in the Holiday Village Mall. I finally got the nerve to ask if Julie would take payments, to which she enthusiastically said “Yes!” and quickly set up a little account for me. I diligently paid it off over several weeks (I had just got a new job as a teller at Bear Paw Credit Union and my wage increased a little bit), dreaming of the day I could put it in my living room. When I made the final payment, Julie carefully boxed it up and said someone had come in shortly after she had set up my payment account and offered her double the price of the lamp. She refused. This reminded me of what being a good Westerner is all about-your word is your bond and you stand by that word. This was not my first lamp nor my first piece of Fenton Art Glass. It is, however, my favorite lamp and the piece de resistance of my modest Fenton Art Glass collection. Fenton was started back in 1905 and a few years ago ceased production of its glassware line, instead choosing to focus on glass beads for jewelry. We Fenton fans are saddened, but that makes our pieces all that much more special to us! One of the things Julie liked to do when the lamp was in her shop was put colored light bulbs in the sockets to match the season-red and green for Christmas, pink and blue for Easter, etc. I’ve done that in the past but alas, I didn’t take any pictures. Here is my beloved Poppy lamp. It also comes in translucent amber and olive green and I think red (if memory serves) and opaque colors such as pink, light blue and green. The style is called Gone With the Wind. It also comes in a different style of lamp I would like to add to my collection someday. My beloved Fenton Art Glass Poppy lamp.